Gutter Helmet® of the Tri-Cities opened in 2009 in Gray, Tennessee. 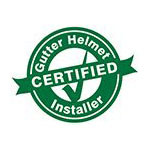 Its owner, Billy Berry, is a certified Gutter Helmet installer with more than 20 years of experience helping people solve their gutter problems with Gutter Helmet® gutter protection products and services. One of the best ways to protect your home from the damaging effects of rainwater to your home is to install new seamless gutters with the addition of an effective gutter cover. Open gutters quickly become blocked by leaves, pine needles, twigs, and even animals and their nests. Unless you fancy getting up on a ladder and cleaning out the muck regularly, these materials will slow or stop the flow of water to the downspout. When this happens, overflowing water can compromise your home’s structures, causing extensive damage to the foundation, roof and walls. Our system of rainwater management means you won’t have to clean out debris, and your gutter system will be much more effective and last longer. Gutter Helmet has a proven track record of over 30 years, becoming America’s most installed gutter cover. We are confident that if you choose us as your service provider, that you will be very happy with the results – we know what we are doing and we care about our customers! Gutter Helmet of the Tri-Cities serves the upper East Tennessee and Southwest Virginia areas. Hours of operation are from 8:00 to 5:00 Monday through Friday and by appointment. Our phones are answered after hours and seven days a week. Please contact us to learn more about seamless guttering and Gutter Helmet leaf guards. Call (800) 824-3772 or fill out the online form here. We are looking forward to being your service provider!